Incredible Hulk Journal #2 - Stupid journal machine repaired by Banner. Puny Banner. Hulk held nose. Hulk beat Ultron. Hulk talked to Dr. Strange until he went away. Hulk got all stupid gems for Chief Examiner. Hulk won, now Hulk sleep. Hulk good enough and strong enough and Hulk know people like him. At the end of my previous post, I was feeling pretty good about myself. I had scored 78 out of 100 points, I had a lead on what to do next, and I was pretty happy with the level of challenge in the game’s puzzles. My feelings of elation evaporated quickly as I started this session, but let me start at the beginning. I had just worked out how to get the beeswax off of the killer bees (by blowing them away with the metal fan) and I suspected that I knew what to do: block the poison gas outlet that Dr. Strange revealed to me. What would happen next, I have no idea, but that would get me to the next puzzle and perhaps that could be solved by one of the items I had already picked up. Let me jump to the chase: it didn’t work. The game text keeps hinting that I am going in the right direction, but either the beeswax is the wrong item or I am using the wrong verbs. I have tried “block”, “fill”, “put in”, and others and I remain stuck. I put this puzzle aside and decide to work on the ants next. Nearly six months ago, I was asked by this blog about my “favorite” adventure game. I remember thinking about that for a long time and answering that Quest for Glory IV was my favorite game now, but that as a kid I absolutely would have picked Space Quest IV: Roger Wilco and the Time Rippers. I played the hell out of this game as a youngster. I bought the floppy version shortly after it came out, loved it, then bought it again when it came out on CD. I must have played this game through a dozen times before I left for college. So why is it that I can remember almost nothing about it now? And here we go again one more time. With a game that comes back just like me. With a vengeance. 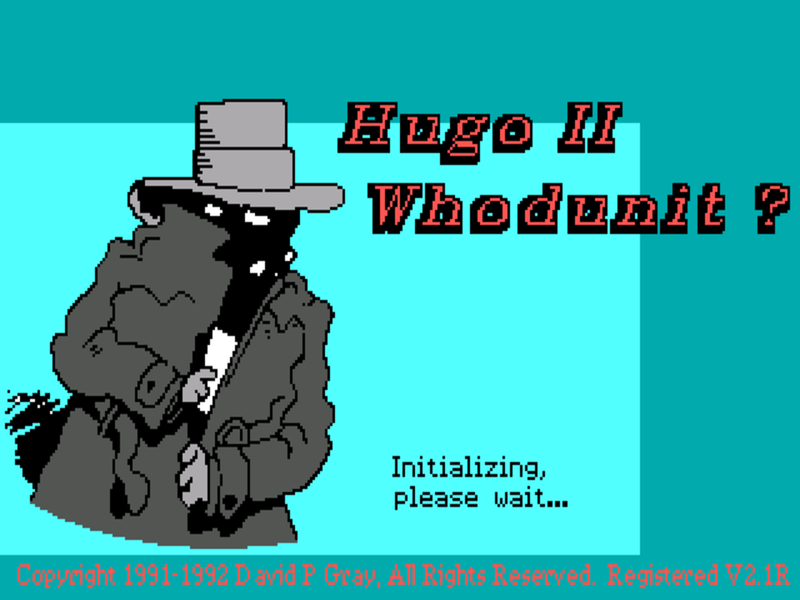 Brace yourselves for the continuation of 1990’s worst game… Hugo II: Whodunit? There is little to add to the introduction of the first game. By this point, David Gray had left his previous job developing software for UK Ministry of Defense to go fully self employed. 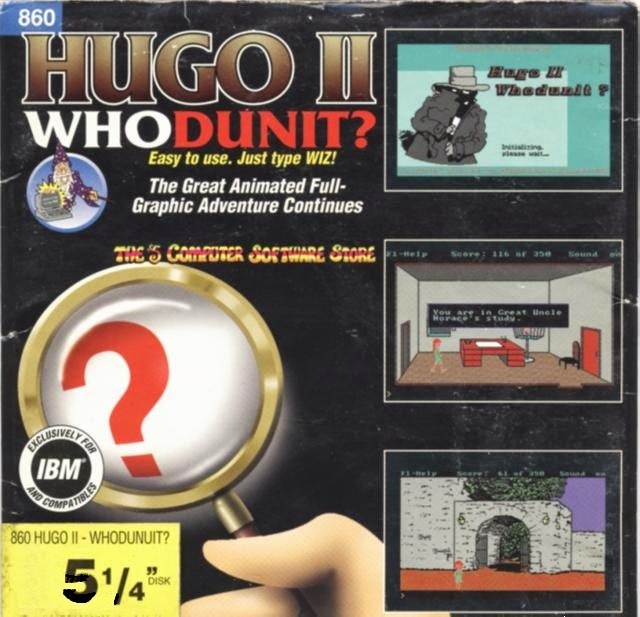 “Hugo II: Whodunit?”, also called “Hugo’s Mystery Adventure” or even “Hugo’s Who Done it?”, was his first game after going independent and seems to keep the same level of excellence and charm as the original. Whatever that level you think it is. I will simply say that is a commendable effort for a single-person project. After the success of the first installment, Gray almost immediately started to think in a sequel. In this interview he admits that he was trying to come up with a clever rhyme or alliteration for the name and ended up deciding between “Hugo whodunit?” and “Hugo’s there?”. As a non-english speaker I’m missing the point of the pun in the first one, but as the second one is lame even by Hugo’s standard, it was the chosen one. And being a fan of Agatha Christie’s mystery novels, it was decided that the second game would be a murder mystery game. I bet the murderer was Bensonmum. The story takes off where the first one ended. After rescuing his girlfriend Penelope and fleeing the House of Horrors, Hugo decides to take Penelope to visit his Great Uncle Horace, at his English country-side secluded cottage. Well, at least is not a house in the middle of a swamp or else I might become suspicious. Ok, I regret anything I said. This an acceptable picture of a house. Inside the cottage, the saucy-looking french maid welcomes them and invites them to a room upstairs. The name of the maiden may be Fifi or may be not, as she doesn’t say any other phrase than “go to your room”. But it is lovely seeing how she blocks any movement that doesn’t involve going up to the room. And… the graphics go full paint-mode inside. Almost as horrible as the maid’s french accent. In any case, Hugo reluctantly obeys and goes to his room with Penelope, who immediately goes to sleep. Being the curious and adventurous type, Hugo starts to loot the ro… erm… search what can he do to pass the time when he touches a yellow book in the bookcase which opens it and makes Hugo disappear. And here is where the game really starts, as we take control of Penelope which is awaken by a heavy noise to an empty room. Giving absolutely no attention to Hugo’s disappearance, I guess he must disappear quite frequently to seek a secluded spot and cry while saying “Bullet!! Bullet! !” , she decides to peek through a keyhole to see what’s causing the noise. And then she becomes the only witness to uncle Horace’s murder. It’s hard to believe now, but comic books were once not the hot property that they are now. In the 1990s and 2000s, Marvel sold the rights to some of their best-known characters, including Spider-Man and the X-Men, for what we might now consider a pittance. All of that changed in 2008 when Marvel released Iron Man, the first of a set of interconnected movies that featured other characters including the Hulk, Thor, Captain America, Nick Fury, and others. Seven years, ten films, and three live-action television series later, the Marvel Cinematic Universe is the most successful and longest-lasting experiment in building many properties into a single coherent universe. Even Guardians of the Galaxy, a team that many comics fans (myself included) had never heard of, managed to take in 774 million dollars at the box office. Holy cow. In honor of the upcoming eleventh film, Avengers: Age of Ultron, I want to step back to a simpler time for Marvel: the company’s first foray into licensing their characters for adventure games. (An action game featuring Spider-Man had been released for the Atari 2600 in 1982.) 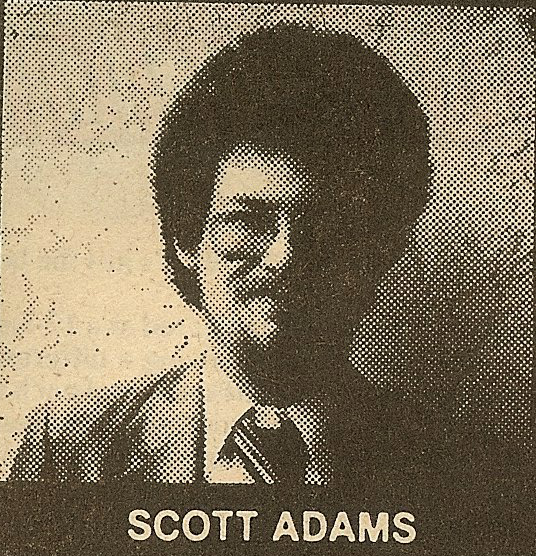 For this attempt, Marvel partnered with one of the kings of the adventure genre, Scott Adams’s Adventure International. 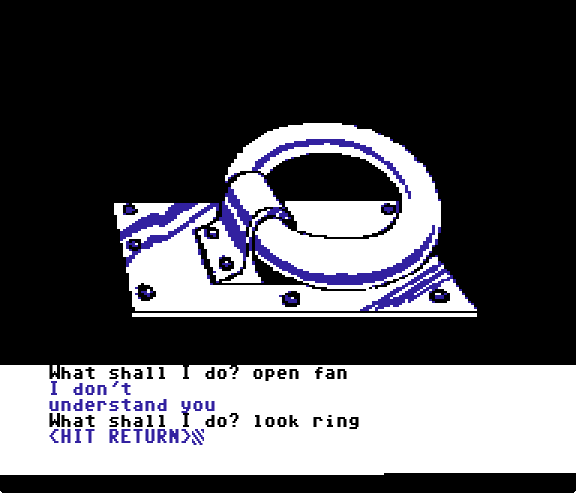 While we have not yet featured any of their games on TAG, Adventure International was the first seller of text-adventures for home computers, broke into illustrated text adventures a bit late, then went bankrupt in 1985. By my count, AI had released about two dozen games (in several series) before winning the Marvel license and producing the Questprobe series. 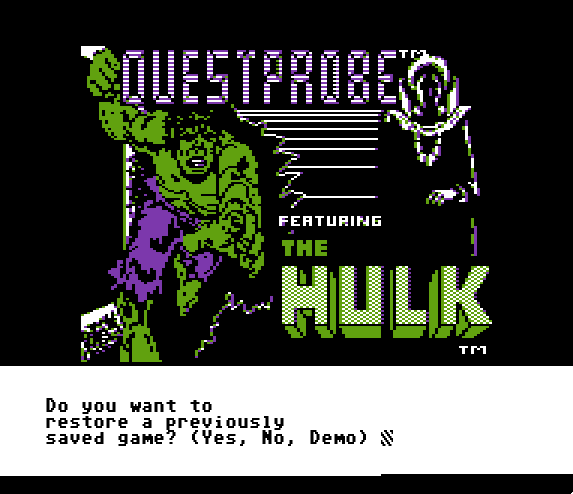 Questprobe was ambitious: A 12-part series with three parts released per year for four years. Each part would feature a different hero or heroes, each would have a tie-in comic, and the sum total would somehow tell an epic story in the grand Marvel tradition. Regretfully, with the end of Adventure International only a year away, only three games were released. 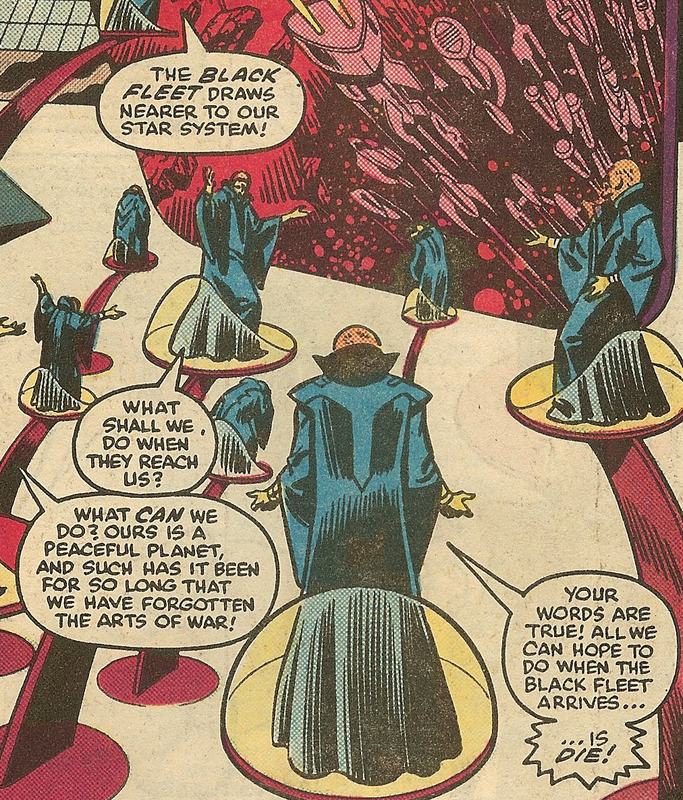 (The tie-in comic for the fourth was released later under the Marvel Fanfare series.) The second game would feature Spider-Man, while the third would feature a team-up between the Human Torch and the Thing, both members of the Fantastic Four. The fourth installment would have featured X-Men characters. 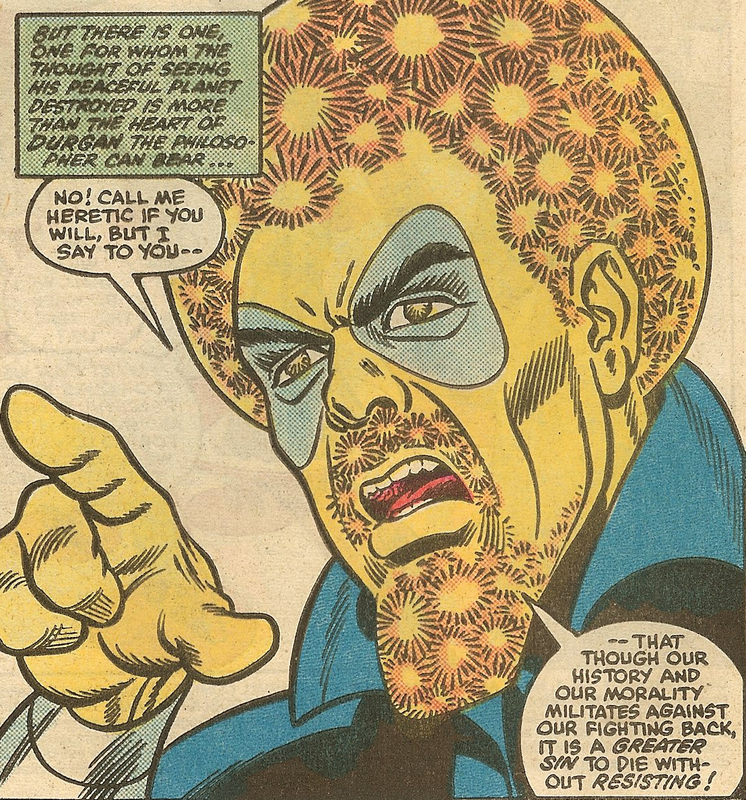 Regardless of what we might think of this series now, it is clear that Marvel took it quite seriously. The art for the game was done by comic legends John Romita Sr. and Mark Gruenwald, as well as Kem McNair. Mr. Romita is a comics legend having drawn some of the most iconic early Spider-Man stories including the death of Gwen Stacy. Mark Gruenwald was primarily a writer at Marvel (he wrote the Official Handbook of the Marvel Universe, part of which is excerpted in the manual for this game) and later became the executive editor at Marvel. 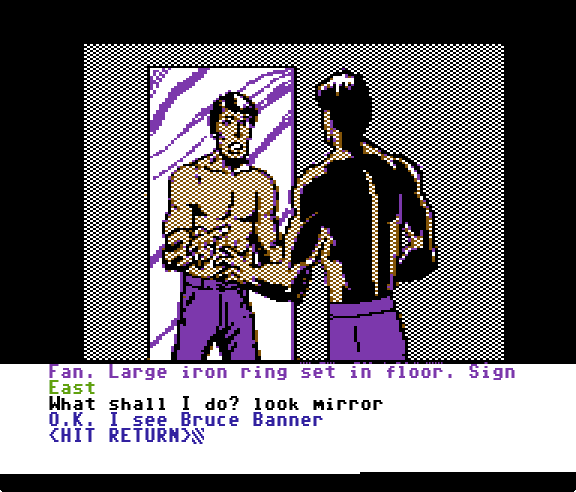 Kem McNair was apparently not a Marvel employee and was probably the artist at Adventure International responsible for adapting the others’ comic art into the game. The outline for the series was done by John Bryne and Bob Budiansky. John was best known at that time for writing many of the iconic stories of the X-Men such as the “Dark Phoenix Saga”, while Bob was writing (or would soon be writing) the Transformers comic. He coined the names of many of the Transformers characters including Megatron, the Dinobots, and others. In other words, Marvel was placing talented people on this project to ensure its success. I’m a true believer in that afro. I have been unable to locate any sales figures or contemporary reviews of the game to tell whether this push was successful, but this does not appear to have been a fire-and-forget project for Marvel. They were committed to the long haul, even if in retrospect we know the series did not quite make it. 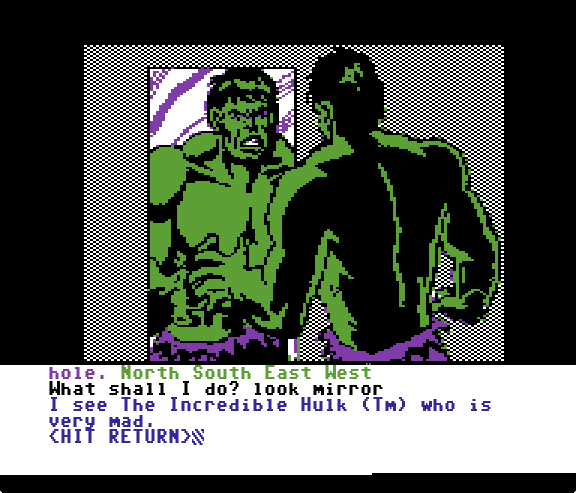 Looking back now, it’s not easy to see why Marvel selected The Incredible Hulk as the first property to make a game from. A lot was riding on the success of the series, so why not choose a character with more “star power” and “mass-market appeal”? 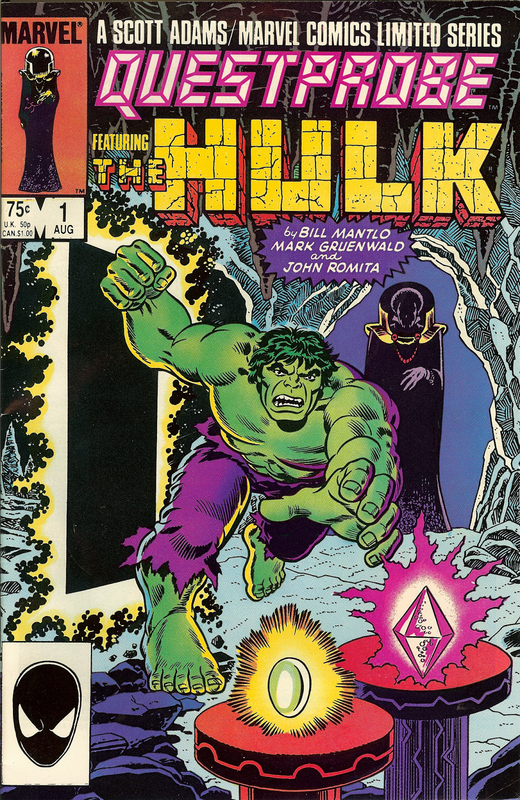 And that’s where we forget: the Hulk was undoubtedly one of Marvel’s greatest crossover successes in the 1980s. 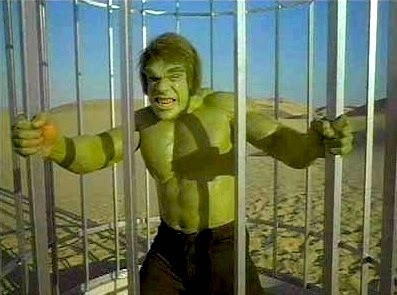 The Incredible Hulk TV series had just ended its five season run, still the longest lasting live-action series in Marvel history, and had proven that a Marvel character could survive in the mass market. Yes, there had also been several Spider-Man shows over the previous decade (both live-action and animated), but none of them had the staying power of the Hulk, starring Bill Bixby and Lou Ferrigno. There would be a Spider-Man game soon enough, but for this first outing the spotlight was on the Hulk. Our story begins in the tie-in comic, Questprobe #1. This comic was sold separately from the game, but is almost essential reading. It covers the backstory for the events that lead into the player taking the reigns. It is actually quite good, with art by Romita Sr. and Gruenwald. In a distant part of the universe, there is an advanced race that has been peaceful for millennia. They have been so peaceful in fact that they have forgotten the arts of war and consider even defending themselves to be against their core beliefs. All of this pacifism is unfortunate because they are being attacked by an unknown “black fleet” which threatens to destroy their entire civilization. They cannot stop this fleet, they cannot reason with it. The leaders of this advanced world can do only one thing: resign themselves to their deaths. The people call a great council to debate their next moves, but the decision is made nearly before they begin. How can they fight, if fighting causes them to lose their core beliefs. Is it better to die following your moral code? Or live by violating it? But as is always the case in these situations, one member of the council does not agree. His name is Durgan and he is a “philosopher”. Durgan is denounced by the council for his views and sent into exile. But Durgan does not give up: he has been observing other worlds where there are still heroes. Could he capture their power? Harness it? Could he use that power to challenge and defeat the black fleet and save his people? Well, I suppose that is what we are about to find out. Meanwhile, back on… wait a second. Durgan looks familiar. Where have I seen that face before? Oh right, a few pages ago in the advertisement for the game! The resemblance is uncanny. Durgan even has Scott’s space-afro! And don’t you think the blue spots around Durgan’s eyes look suspiciously like Scott’s glasses? Perhaps I am imagining it, but I don’t think so. Anyway, where was I? Meanwhile, back on Earth, the Hulk is having a bit of a disagreement with the National Guard. I suspect that happens quite often. Unbeknownst to the combatants, a new player is on the scene to watch the fight. He is using a computer to learn from it, even to learn the humans’ language. This figure is known as the Chief Examiner, and while he looks suspiciously like Durgan with a helmet, the reader is left in the dark who he might be and how he might relate to the warrior-philosopher. I am not sure that they would make it quite obvious, but whoever it is he is after the Hulk’s power. 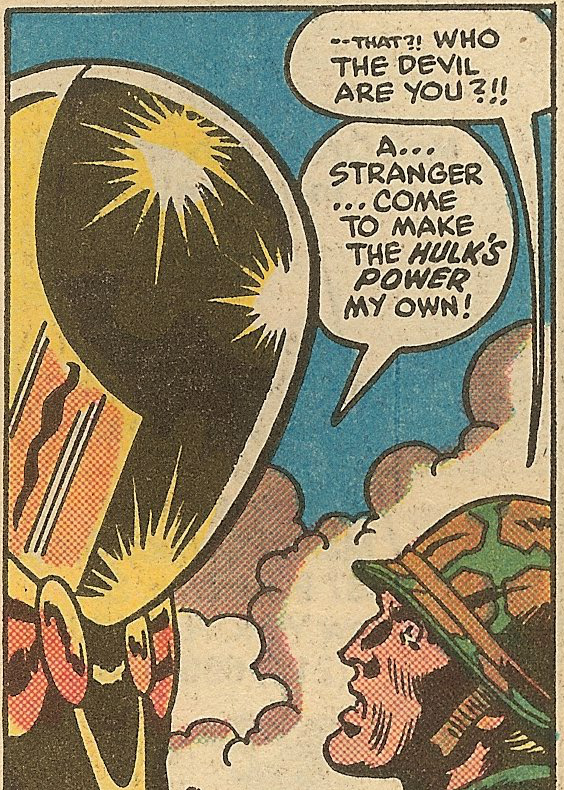 The Hulk escapes the National Guard and flees to a cave where he is blown up (as I will be, many times over) by a “Natter Energy Egg”. He shrugs it off and decides to sleep in the cave, allowing the Chief Examiner to discover that the Hulk is nothing more than a normal human who happens to turn into a monster when he’s angry. When Dr. Banner wakes up, he flees the cave only to tumble off a side of a cliff; he did not quite remember where the Hulk had put him. Fortunately rather than being reduced to human-pancake on the ground, he transforms into the Hulk on impact and flees with the Chief Examiner right behind. With the Chief Examiner trying to catch the Hulk in his moving black doorway, the pair stumble onto a group of white-water rafters and in the ensuing chaos one of them falls in the water and starts to drown. 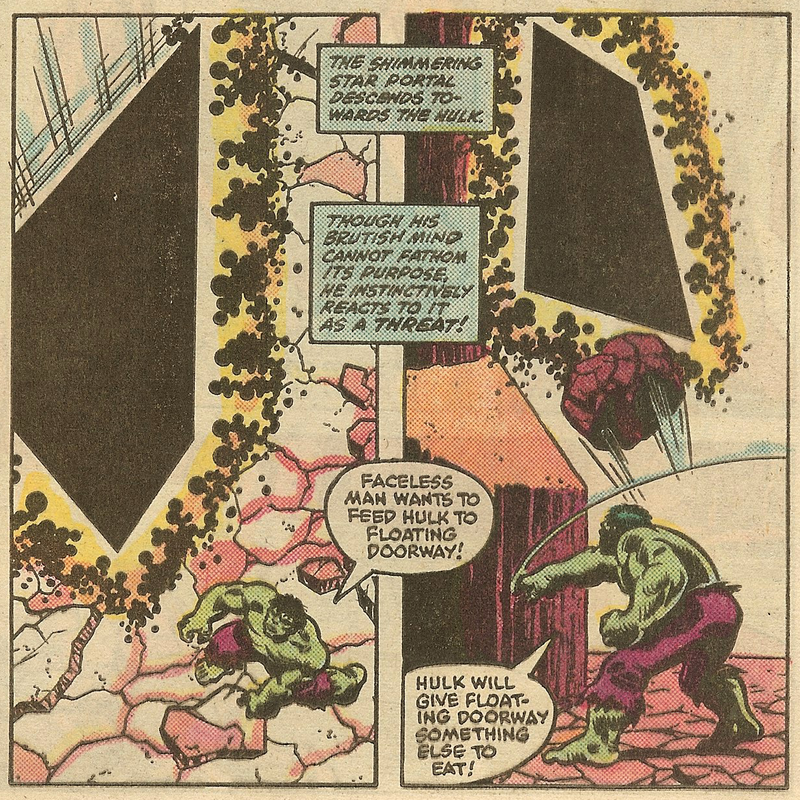 The Hulk immediately changes gears to rescue her, but the Chief Examiner takes advantage of the situation and forces the Hulk to pass through his doorway. 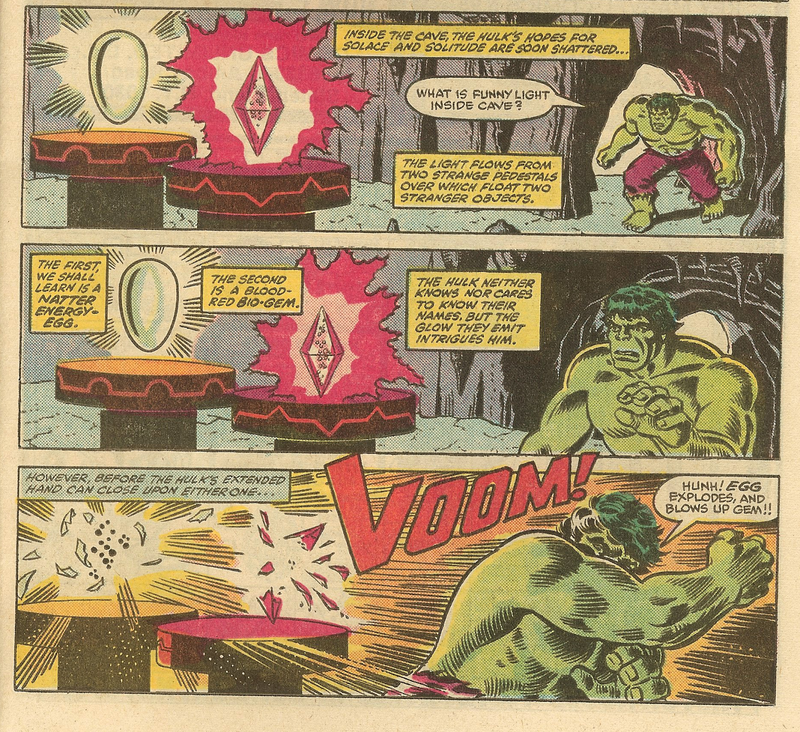 Instead of teleporting Hulk into the game (what I expected to happen), the portal instead worked as something like a scanner. 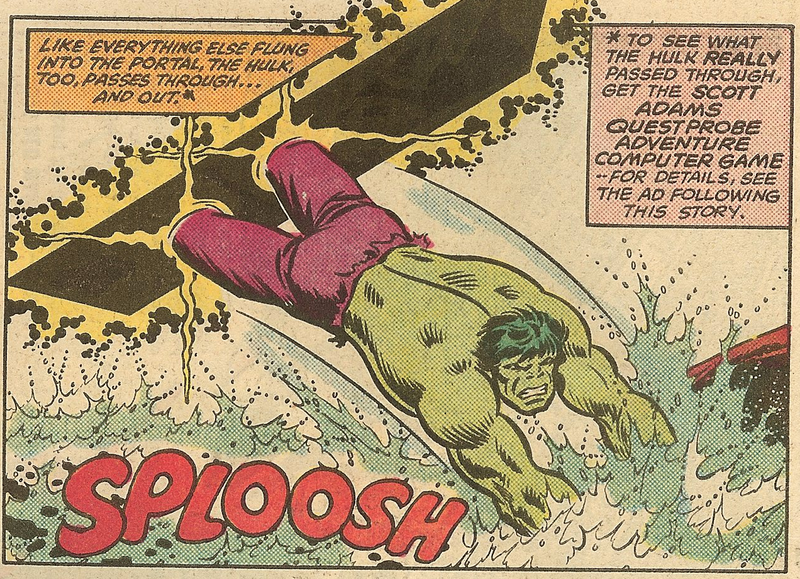 It analyzed the Hulk and allowed him to pass through to the other side so he could save the drowning woman. Having already scored his prize, the Chief Examiner leaves the scene and the comic comes to a close. The comic is actually quite good, both as an introduction to the character of the Hulk and as a jumping off point for more stories about Durgan and the menace of the black fleet. 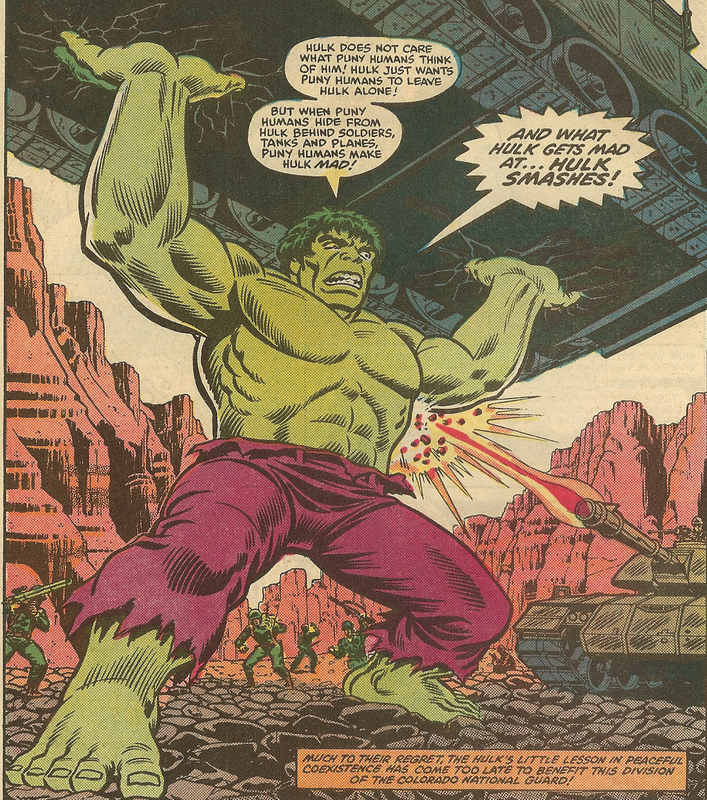 The Hulk is depicted as being both heroic and misunderstood, the connection between him and Bruce Banner is explained, and several of Hulk’s powers are depicted. If I was a computer game purchaser that was not interested in comic books, I think I would get a pretty good idea of what the Hulk was all about from this issue. It made me want to read more. I hope that there will be some questions answered in the short time we have with this series before the bankruptcy, but all I can do is just wait and see. I will read the others when the time comes. 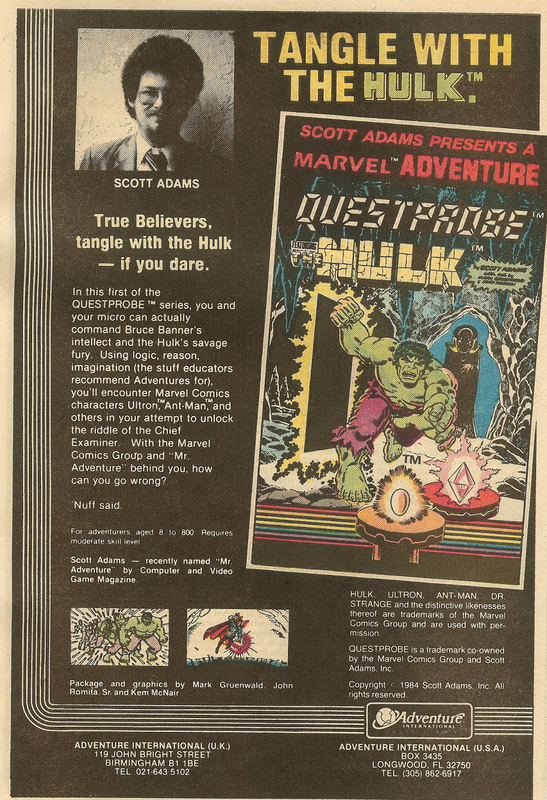 Interestingly, Scott Adams and Marvel did not choose to include any of that backstory in the game manual itself. The booklet includes the normal instructions on how to load and save the game, as well as some hints on how to approach the game, but it also includes one more awesome feature: character guides. 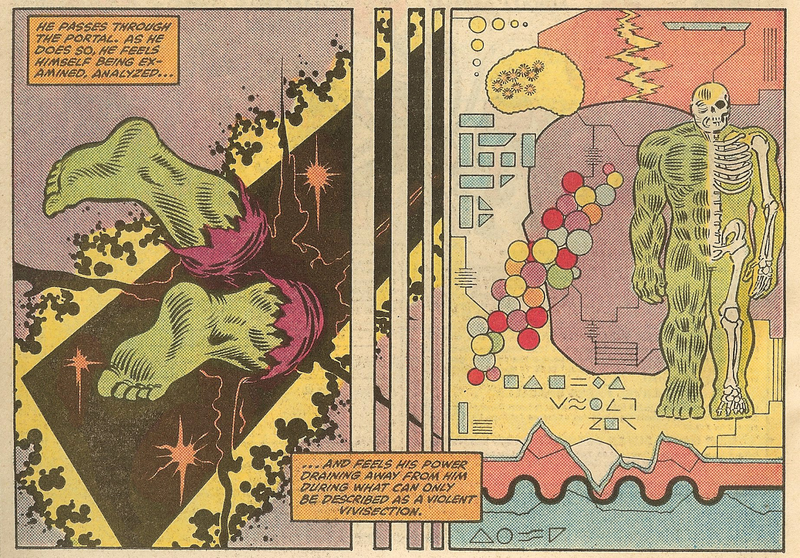 Each denizen of the Marvel Universe that the Hulk is likely to meet in the game is depicted in the manual, with a glamor shot, a brief history, and a textual description of the person’s or creature’s powers. From that, I can surmise that Dr. Strange, Ant-Man, Ulton, and Nightmare are likely to appear, but I will cross that bridge when I get to it. 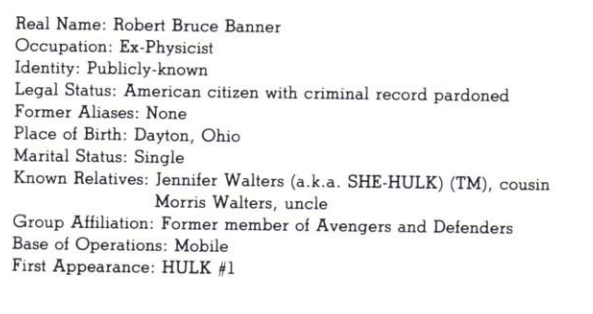 All of these biographies appear to have been adapted from the 1983-1984 edition of The Official Handbook of the Marvel Universe by Mark Gruenwald, although I do not have a copy to double-check whether this is taken verbatim from that guide or is a new work in the same style. If someone has a copy, please let me know. And with that, I’ve talked far too long! Let’s play the game! Incredible Hulk Journal #1 - Hulk wake up, hulk no know where he is. Hulk smash! That no work. 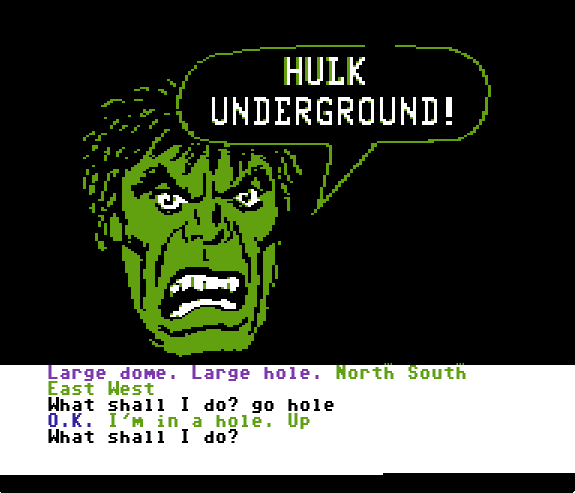 Hulk dig holes. That no work. Hulk smash puny ants, but that no work too. Now Hulk smash stupid journal machine. Damn. Did I forget the safeword again? As the game begins, I am Bruce Banner, tied hand and foot to a chair. How did I get here? I have no idea, but that isn’t really the problem right now. First screen and I already have the first puzzle! Obviously, Dr. Banner cannot do much about breaking free, but this isn’t a game about a brilliant scientist. 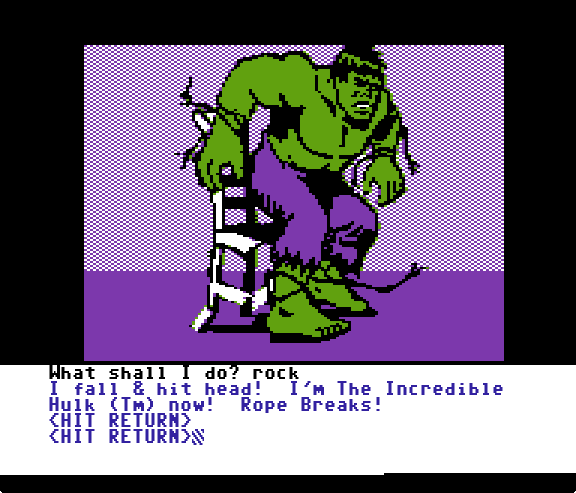 This is a game about the Hulk and HE wouldn’t have any difficulty getting out of the chair. I try the obvious first: “become hulk” doesn’t work, neither does “get angry” and the game helpfully asks me how to do those things. I also try “struggle”, “yell”, and “stand up”, but those don’t work either. I cannot look at my inventory when tied to the chair, so it’s clear that there is just something I need to do here, but what? Eventually, I try to “rock” the chair. That works! I fall over and hit my head, but the pain brings out the big green guy and he breaks free! But just when I think I might be able to smash something, a strange gas fills the room and I am forced to revert to being Dr. Banner. But on the bright side, I am free from the chair and can start to look around. This computer model has been created so that you will learn to perform as the HULK! 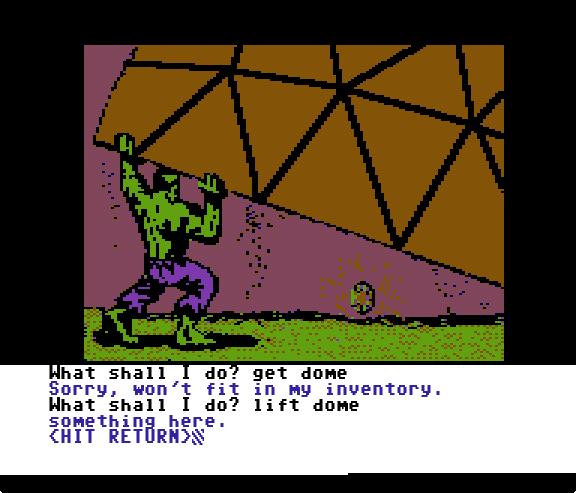 To prove that you can supply the brains as well as control the Hulk’s brawn, you must collect all the *Gems and store them in the proper location. Good luck! Just as I suspected: it seems that “I” am trying to learn to control a copy of the Hulk that was created when the black portal scanned the real deal in New Mexico. I assume that I am a member of Durgan’s race, but I have no idea. It’s quite meta! Even the inventory screen has a separate view, clearly laying out all of the items that you are carrying. I love the detail! I checked later and yes, you get a screen with the Hulk instead if you are transformed. As any good adventure gamer would, I pick up everything nailed down. 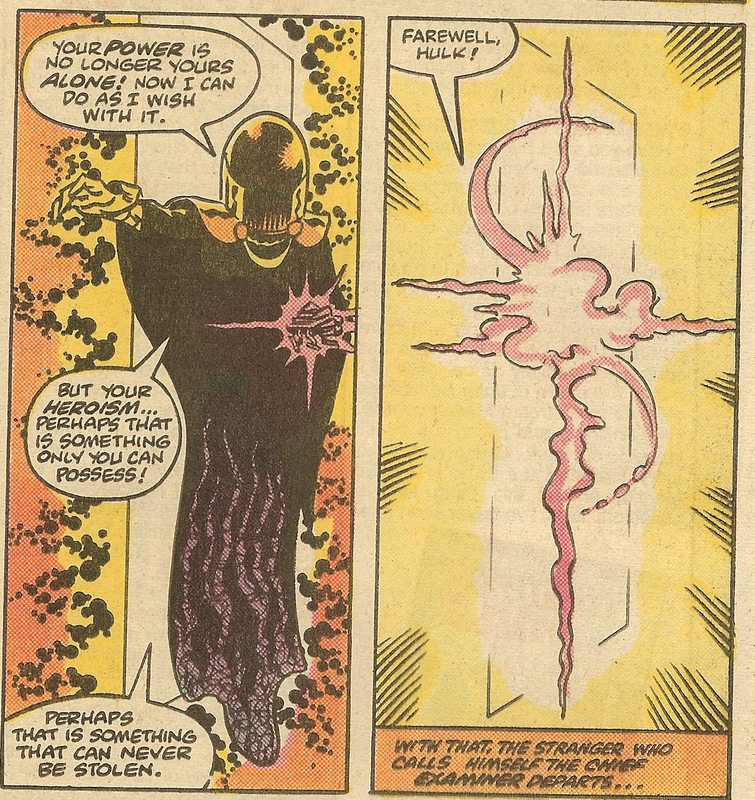 Bruce is not strong enough to get or pull on the iron ring, but any attempts to transform here result in more gas and switching back to Banner once again. Obviously, I have a puzzle on my hands, but I suspect it is one I will come back to later. I head east to a tunnel with a button and a sign. The sign is warning me of high gravity ahead, which sounds deadly. When I push the button, I get a message that says “delay on”, but no clear idea what it is delaying. I try to leave the dome but, as expected, I die immediately in the high gravity. I guess I need to be the Hulk to get out. Instead of having to start over, the game sends me to a much nicer place: heaven. The next time in the tunnel, I press the button and try to turn into the Hulk. Just as before, “become angry” doesn’t do the trick but “bite me” does! 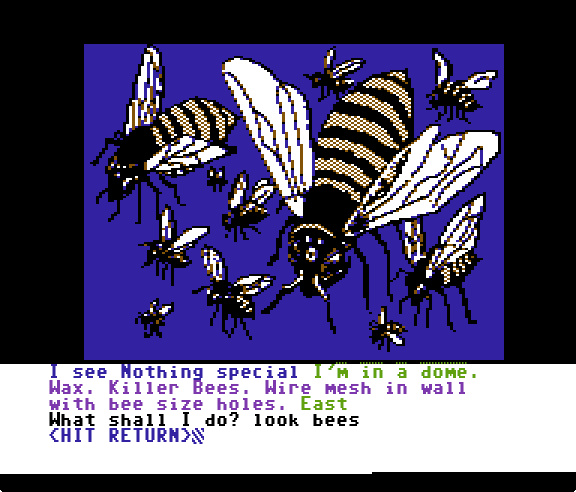 Gentle readers, this has been one of my life’s dreams: I have successfully used “bite me” in an adventure game and have it do something important. Luckily for me, the gas does not come as quickly this time and I am able to leave the dome. Better yet, the Hulk can survive the high gravity. Time to see what else is out there! The first screen has a gem, but nothing obvious to do. I march off in a random direction (north!) and find myself in a warp, ending up in a “fuzzy area”. It’s a strange, trippy place with lots of Escher-like structures and, conveniently enough, a sign. I did not know it yet, but there is actually a third dome that looks identical to the starting dome and I only noticed when I did something to change the scenery. More on that in a bit. Rather than narrating these completely straight as there was plenty of jumping back and forth to try things in each location, I will narrate the areas one by one. Trust me, it makes much more sense that way than trying to following my lunatic thought process as I flip back and forth from puzzle to puzzle. I head north off of Limbo the first time through and find myself in this “underground room” with no exit. Like in the dome, I am immediately gassed back to being Bruce Banner. Before I can worry much about not having a way out, the egg explodes (one turn later) and Dr. Banner is dead. But when I return here after going to heaven, the room is empty: the explosion also destroyed the Bio gem. I restore my game and try a few things, but I cannot find a way to get the gem. I can become the Hulk immediately after arrival and that allows me to survive the explosion, but there is no time to do anything else and the gem is still destroyed. I suspect I will need to come back to this one later. Regardless, I head off to try to find a puzzle I can solve. One one of my next trips from the fuzzy room, I wind up in the Chief Examiner’s office. He even has his name stenciled on the door! I’m really glad that he has a space where he can file paperwork after a long day of capturing heroes in strange black portals. Fortunately, the Examiner does not notice me and I can explore his room a bit. There’s a gem on his desk and I also notice that he is writing a computer program. What program might that be? Why, the next Questprobe game, of course! Now, here’s the odd thing: is he programming on paper? I was not a programmer (yet) in 1984 and I have done my fair share of jotting notes and doing basic design on paper, but it really looks like he’s coding on paper and plans to type it in later. That’s just strange. 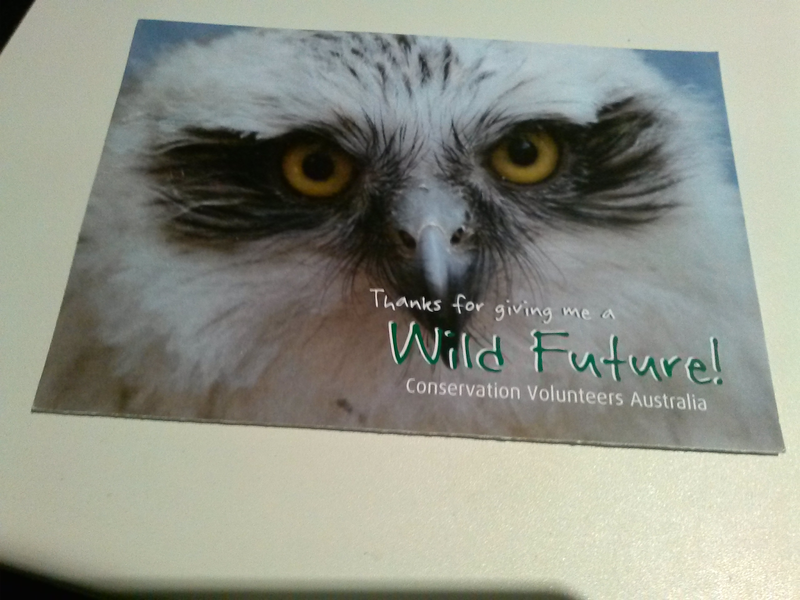 With the gem I nabbed from his desk, I’m up to 17%! On my next exit from the fuzzy room, I find myself outside a dome that looks exactly the same as the other one, except for one detail: the giant ant colony outside. There’s also a gem, which I pick up, but that’s when it happens: alien army ants swarm out of the nest. Before I work out what to do, they surround me and crawl into my eyes and kill me. That is a surprisingly grisly death. Subtle innuendos follow, must be something inside. On the next attempt, I grab the gem and dart for the nearby dome. Inside it is nearly identical to the first dome, except for not having an iron ring in the floor. Even without the ring, it still has the anti-Hulk gas and I am quickly back to being Banner again. At this point, I am pretty sure that I am stuck and I just start trying lots of random things in different places. 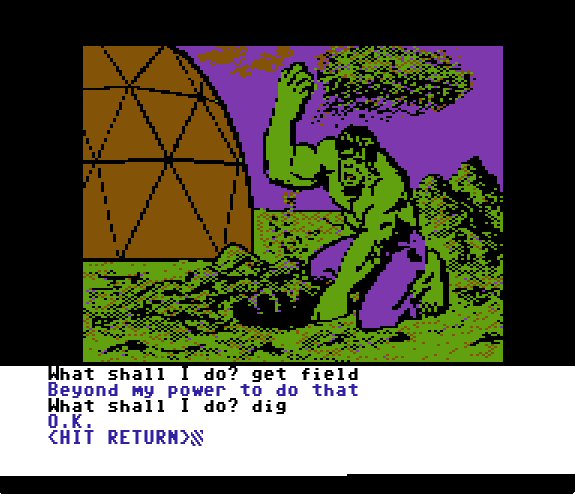 Outside the first dome (with the iron ring), I type “dig” and the Hulk digs a hole! I also get a great action scene of the Hulk digging. Yes, I tried “get field”. That was the type of random nonsense I was trying. I climb into my freshly-dug hole and find a gem. I also discover that I can keep digging, but that if I keep doing it I eventually break into the hot magma underneath the planet’s crust and die. Hulk must be very good at digging! I restore and stop digging when I get a warning that it is starting to get a bit warm. Screens like this are one of the reasons I love the art in this game. As I continue to explore, I find myself back at the “first” dome again… but this time it doesn’t have a hole. What gives? Did my hole disappear? No! It is a completely different but otherwise identical dome. I am not sure if this is supposed to be a puzzle or just bad game design, but either way I have something new to explore. Maya gives and Maya cares. Inside this new dome is a nest of killer bees as well as a stash of beeswax. Strangely, the bees do not seem to mind my being in the dome, but any time I try to get wax they sting me, I turn into the Hulk, I get gassed, and then I turn back into Dr. Banner. It’s almost funny, but I guess it is better than dying. There is some wire mesh in the wall that leads outside, which I assume is how the bees come and go. Even though I have a new dome, there is not that much new to explore as I do not have an immediate answers on how to get that beeswax. I take this time to dig holes in front of each of the other two domes (two more gems! ), then resume my game of trying crazy commands until I find one that does something. The first that I stumble on is “lift dome”. How this makes that much sense, I have no idea, but it seems that someone has hidden some gems underneath! Now how did this get here? 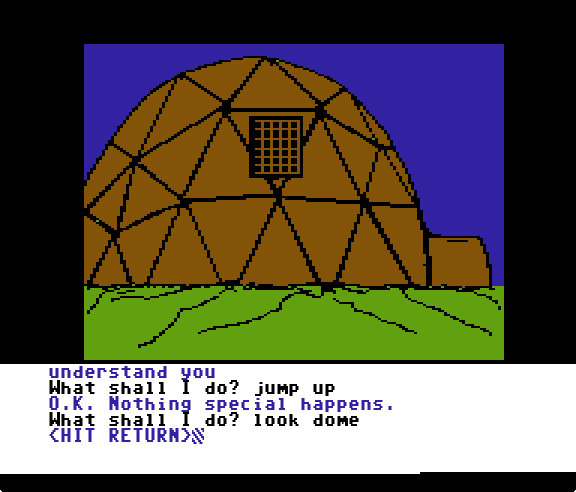 The second command seems obvious in retrospect, but I can also use “look dome” on the bees’ dome to see the wire mesh outside! What makes this infuriating is that you do not see anything special looking at the other two domes, so having this be different is just another little infuriation. Still, it’s progress. Still looks like a space igloo. That gives me some terrible ideas and one excellent idea: I wave (as the Hulk) the metal fan at the hole to cause a powerful gust of wind that blows all of the bees out of the dome! I have no idea where they are going now, but the important thing is that I can get the wax. Even better: I have a pretty good idea of what I want to use that wax on: the gas outlet. Guess what? I’ve played a bit farther now and have managed to get stuck… well, let’s just say more than a few times. If you want some easy CAPs, now would be a great time to wager where it was that I got hung up. It will be like shooting fish in a barrel. I do not need clues as (in the interest of time), Ilmari and TBD provided some clue-assistance so that I could win the game. Don’t forget that you can also still wager on the final score! 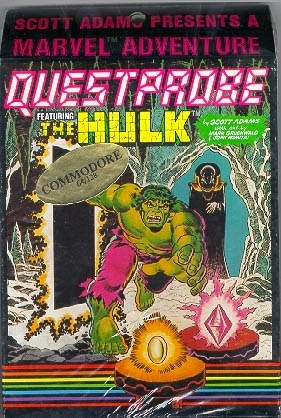 Would you like to win this completely un-signed and non-mint copy of Questprobe Vol #1 Issue #1? How about issues #2 and #3 as well? I bet you would! Between now and August, I will be playing the three Questprobe games, with each “Missed Classic” coming out with a summer Marvel feature: #2 prior to Ant-Man in July, then #3 with The Fantastic Four in early August. After that is over, I will wrap up with a series-wide recap and an “epilogue” of how Marvel ended the series (and the Chief Examiner) after the collapse of Adventure International, as well as announce the winner. All you need to do is write a comment (as many as you want) describing why you love or hate a character that appeared in our Questprobe adventure. I will randomly pick from the best comments to select the winner. For #1, the included Marvel characters are the Hulk, Dr. Strange, Ant-Man, Nightmare, and Ultron. Please avoid using characters from later in the series so as not to spoil me on those games. Good luck! 1990 was NOT a year dominated by Sierra! In fact, almost no game of the Sierra main series was published this year, and even those published had something new in them. 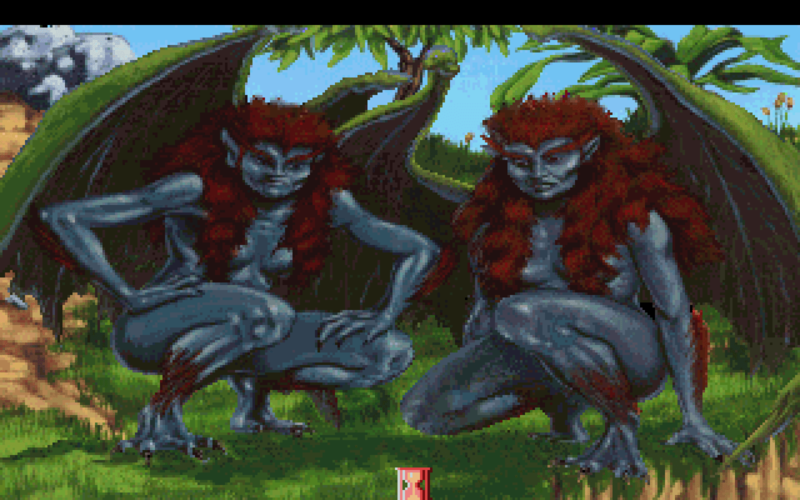 Hero’s Quest changed its name to Quest for Glory in the second game of the series, King’s Quest started the tradition of Sierra remakes and King’s Quest V turned Sierra finally into VGA point and click. We also got the beginning of Sierra’s Conquest-series with Conquest of the Camelot and Dynamix started developing games for Sierra with Rise of the Dragon. Although we didn’t see so many Sierra games, there were few companies publishing clear Sierra clones: Interstel with Earthrise and especially Accolade with first Les Manley and Altered Destiny, none of which lived up to the original. 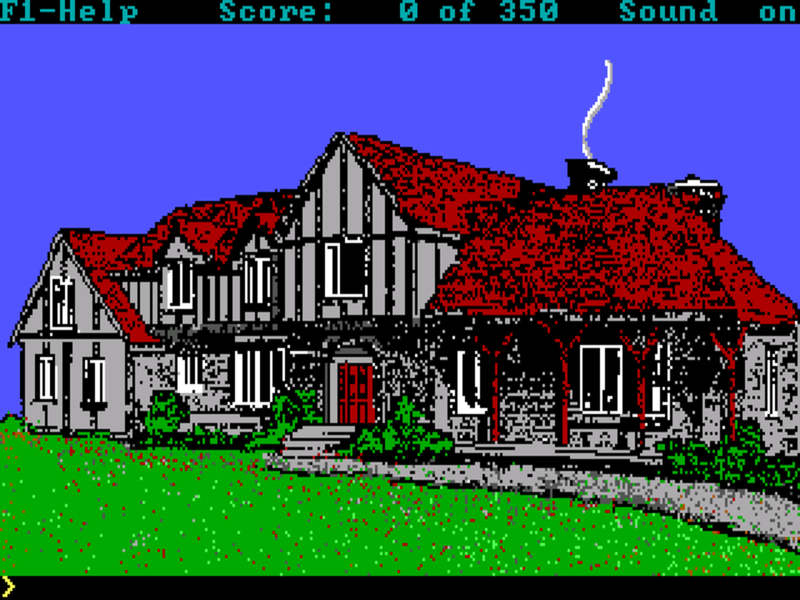 In fact, 1990 was a year for many new adventure game publishers: notable examples are Delphine Adventure, publishing first French adventure games that were not complete trash, and Legend Entertainment, which rejuvenated the graphic text adventure genre. 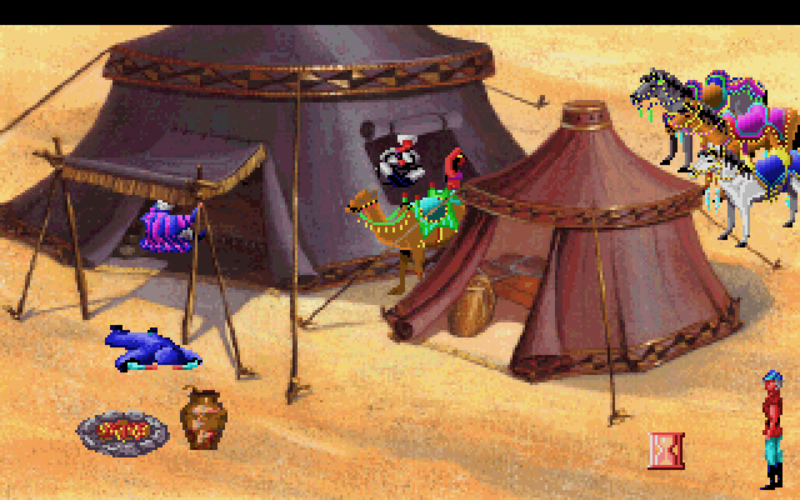 But the true winner of the year was once again Lucasfilm with Loom and especially Secret of the Monkey Island. The year was also full of surprises for The Adventure Gamer. Trickster decided to step away from adventure game blogging and TAG became a community effort. Since most of the games in 1990 were still reviewed by Trickster, the TAG awards are also mostly decided by Trickster - although rest of the reviewers of this year (Aperama, Joe Pranevich, Deimar, Ilmari and TBD) have also had the opportunity to choose their favourites. Let the award ceremonies begin! In trying to rate King's Quest V I tried to compare it by what came before, particularly the previous King's Quest games. 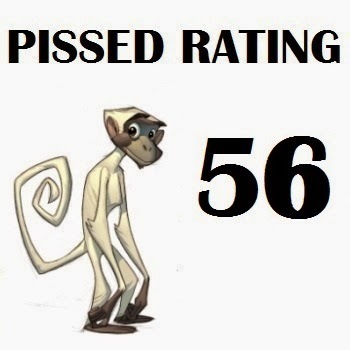 King's Quest V has the disability of coming out soon after The Secret of Monkey Island, a game that raised the bar significantly for almost every PISSED rating category and therefore raised the bar for what you need to do to get a good PISSED rating. There were some categories where I was really close to going a point higher or lower but hopefully the final score is a fair one. Some of the puzzles were fairly satisfying to solve. Most of them were simple variations of having the right inventory item. I can't recall any puzzle that was particularly good but many were serviceable. The ones that weren't though - some of those were terrible. I was stuck a few times: I hadn't effectively pixel hunted once; I'd dead ended myself another time; and the third time I just had to do something I never would have done if not prompted. The 'best' puzzle in the game was probably the desert temple puzzle. Seeing the bandits knock on the temple door, trying it myself, then realising I had to go back to their tents to steal their staff was fun, though simple, to work out. That's really the only puzzle I could think of that didn't consist of, “Oh, I'll just try this inventory item I picked up earlier” or “I don't have any appropriate inventory items so I'd better click randomly on every screen in case I missed something” There was no combining of items in the inventory, though you can use inventory items on yourself. In fact, now that I think about it, I can't remember more than a handful of times you use an item on an item in the environment. 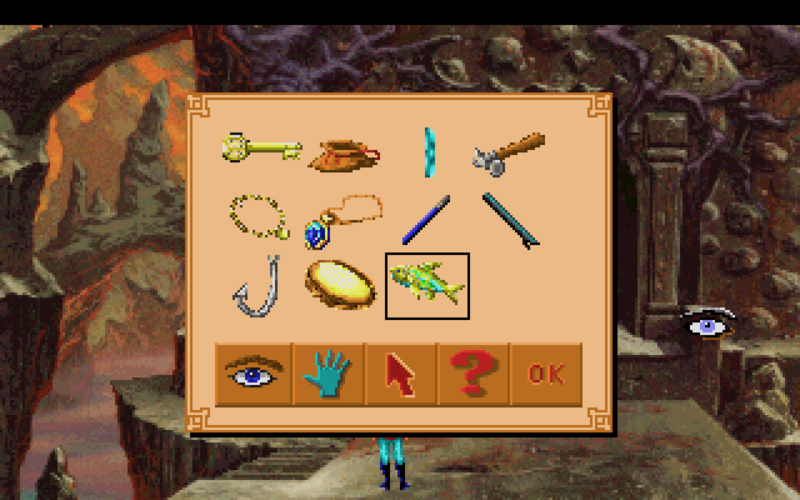 The vast majority of puzzles are solved by giving/throwing an inventory item to/at a character. Some puzzles are too hard to work out – the honeycomb puzzle was one I'd worked out accidentally by trying to do something else - that's also how I found the labyrinth compass, which should never have been invisible in the first place. The library waiting puzzle is almost impossible to solve on purpose. Furthermore, there's no direction to the puzzles. You almost never get the option of looking for something specific, so never really have the chance to use your brain to solve the puzzles. At the beginning of the game you know you need to go east to get to Mordack's castle, but the way east is guarded by a snake. The only way to get past the snake is to solve all the other unrelated puzzles until a tambourine suddenly appears on a screen it wasn't on before. Two exceptions are the baker saying the pies cost a silver coin and the gypsy saying I need a gold coin. But there was no thinking involved about looking for those items. I never thought, 'where will I find a gold coin – Is there a mint in the game, or a bank?' I just waited until I found a gold coin in a random location, then used it. 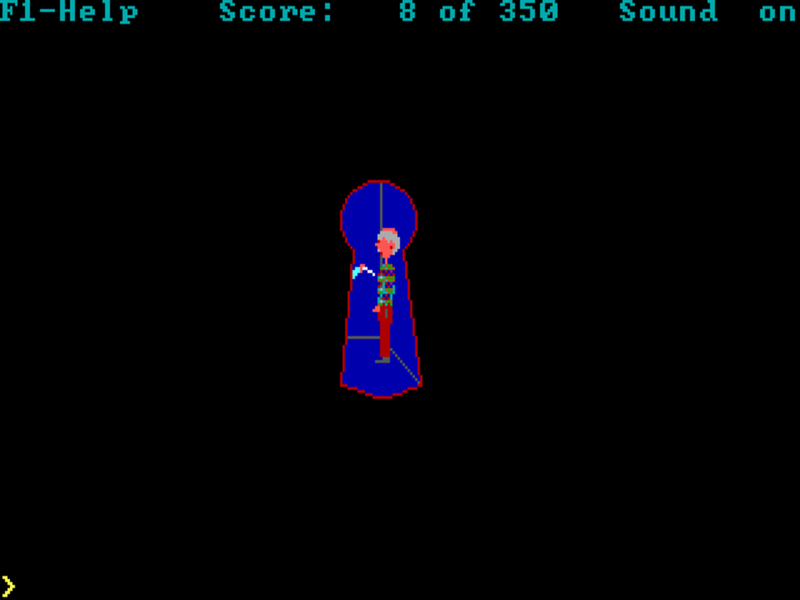 Good adventure game puzzles have you specifically looking for things. 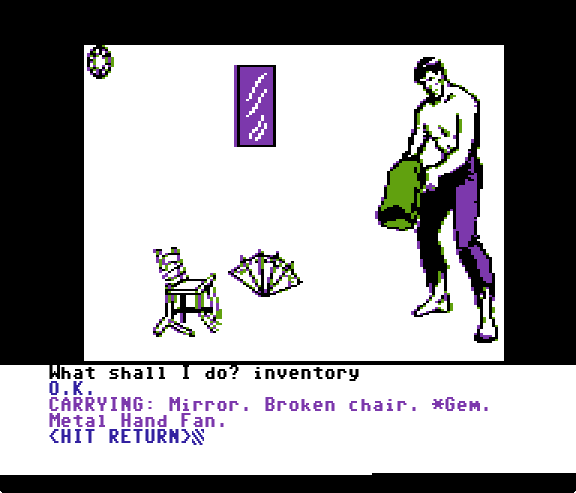 The puzzles in King's Quest V are simply, 'get past this obstacle... somehow' and the way to solve them is to throw inventory objects that you've found in random locations at the puzzle until it clicks. An example of this lack of thinking was the rope 'puzzle'. When I'd thrown my rope at the branch and died while climbing I was thinking, 'perhaps I need some way to harden the rope or perhaps I'm too heavy - can I lighten my load somehow?' when the solution was 'you didn't pixel hunt on this screen enough – the branch is a red herring'. 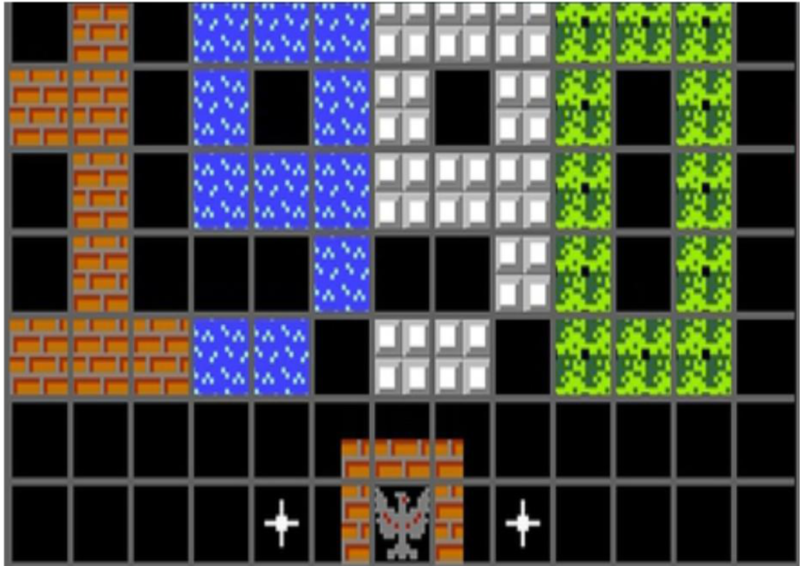 Apart from the inventory puzzles we have the three mazes: the ridiculously large desert with three important locations; the not too large ocean but with only 1 important location; and the deliberately hard-to-map labyrinth with 2 important locations (one of which is randomized) that contains the compass that only appears if you 'look' at the empty space below the screen. At best these mazes were not too bad. At worst they were just boring and only there in order to increase play time. I also really don't see the fun in dead ends. I'd counted 19 of them and the existence of them makes you spend too much time second guessing yourself – maybe there was something I needed from the snake before I scared him off. Maybe I missed an item in the desert that I now need in Mordack's castle. Again, something that is only there to increase play time. The interface was good. With pathfinding and asimple right-click to cycle through icons mechanic it did its job well. Comparing the interface to the Lucasarts one, this wins out in having icons instead of words on the bottom of the screen. It allows more of the screen to show the game graphics but still gives easy access to all necessary verbs. You can get the verbs both by right-clicking to cycle them and by mousing up to the top of the screen where you get the whole icon bar and inventory. The one thing missing that some earlier non-Sierra games have had was a tooltip when scanning the screen with your mouse. This would have helped me not have to click on every part of the background and hearing the same message over and over, and would clearly have made the game easier. Overall, pretty good job on the interface - some improvements to what's come before in the point-and-click genre but missing the important tooltips or "What is" option, perhaps deliberately so, to rely on the gamer missing things on the screen. Inventory was up to par with the exception of combining items. 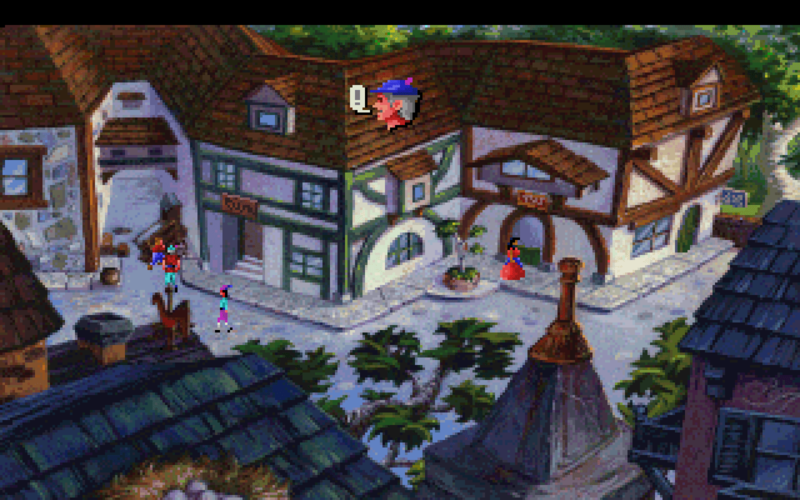 The story was standard King's Quest fare. Nothing too out of the box here. Evil wizard kidnapped my family. Rescue my family and destroy wizard. Everything in between, apart from perhaps meeting Princess Cassima, was just random obstacles thrown in the way of my goal. 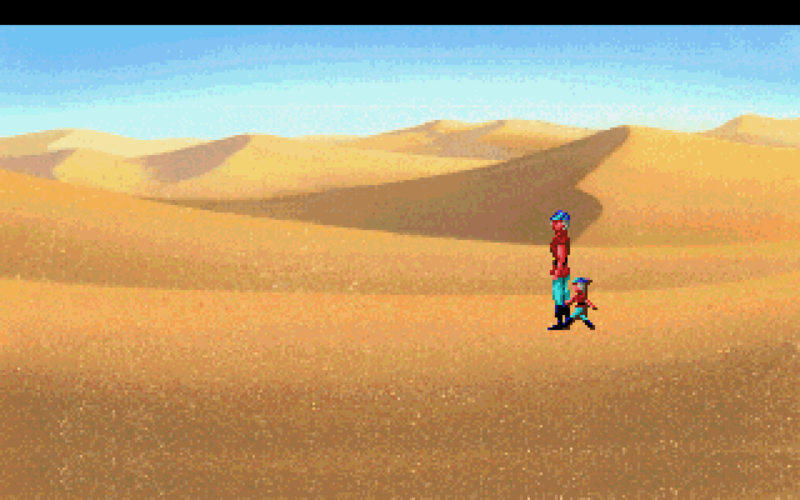 How does wandering a western desert help me travel to an island far to the east? Because I need to pick up a shoe to throw at a cat so a rat will save me when I'm trapped in a cellar – otherwise I won't have a leg of lamb to give to an eagle so he'll carry me to a beach when I'm captured by a roc. That's why! There are small unrelated stories in between but its all simple fairy-tale stuff – the transformed princess with the stolen heart – the ice queen with the need for a hero to kill a monster – the labyrinth below the castle. None of it feels like a part of a greater whole. This is definitely where the game shines. Graphically the backgrounds are even better than our current leader in this category. Some of the detail is amazing. The character models are much more simplistic, but still decent. Character animations were nice and there were lots of them. I liked that things were often happening in the background - the toymaker's granddaughter playing with her doll and the face that follows you across Mordack's organ room being two examples. I particularly liked Graham picking up the dying Cedric on Harpy Island and carrying him back to the boat. Sound wise, the game has bubbling brooks and appropriate sounds but one thing I loved was the use of music. Almost every location had its own music which really helped add to the location's atmosphere – the desert's music was lonely and solemn, the willow tree's music was sad, the forest music was slightly eerie, the town music was upbeat and annoying - and was softer when outside the town but louder inside. The idea of each piece of music was great, but there are no standout tunes. Nothing really made me want to listen to it specifically, but that's not what I really need music for in games – in this game it served its purpose brilliantly. I've just mentioned how the sounds and graphics added to the games atmosphere. As do little things like the toymaker's son coming in from the back door occasionally or the picky man in the tailor's shop who hates all the clothes he tries on. If the environment had been more unique this category might have also scored high, but almost every place just screamed 'generic fantasy kingdom' at me. There seemed to be no particular thought to how the world should be put together. It was just – town section, desert section, forest section, icy mountain section, beach and ocean section, evil castle section. On balance, I'd say this game would be average in this category, but the voice acting adds to the atmosphere as a whole making it seem that much more real. Dialogue in the game is mostly average, with some sections a bit too unrealistic and simplistic – there was none of Monkey Island's witty conversations or none of the good dramatic dialogue we'll start seeing soon in other games. It's all just... there. The dialogue isn't compelling and the acting isn't great, but it's VOICED! There are no dialogue options. Any conversations happen without any input from the player so I can't give a particularly high score here. Acting is, as we've all heard, bad. But I find it hard to poopoo the game's acting when it's the first fully voice acted game we've had. Any acting at all helps the atmosphere as opposed to reading paragraphs of text that take up half the game screen. It's definitely not even close to the worst voice acting I've heard and while this voice acting performance would be laughable today, at the time it was innovative. Mean Streets may have had some voice acting before, but King's Quest went all the way and had every line of dialogue acted. That kind of commitment deserves to be rewarded and I'm giving King's Quest V points for being the first game to do what became a staple requirement for future adventure games. So, taking into account the average non-interactive dialogue and innovative use of voice acting I'll score this section right in the middle. 34*100/60 which equals 57. I'll take a point off largely because my biggest dilemma was whether to give Sound and Graphics an 8 or 9. That leaves the final score as 56. This gives the game a slightly above average score, which I think is deserved as despite the annoyances I had more fun than not while playing. So, did anyone guess 56? Yes, Kenny McCormick. Congratulations, Kenny. And now, on to the CAPs! Game 52: King's Quest V - Won! Game 50: B.A.T. - Merigo 'Round + WON!